Sandy Beasley and I arrived at Shawnee State Forest late in the afternoon on May 17 after driving from Magee Marsh. We had just enough time for a stop at the Shawnee State Park office to pick up a “birding map” created by the park naturalist. The state park is nestled in the middle of the state forest and contains most of the recreational facilities. Hundreds of athletes participating in the American Triple-T triathlon filled the area and we were happy to get away and drive a peaceful gravel road. Immediately, we were struck by the spectacular beauty of the forest. And, even late in the afternoon, we could hear birds singing everywhere. While Magee hosted mostly tired, hungry migrants, Shawnee was home to breeding birds. And an ideal home it was, providing 65,000 acres of high-quality habitat. We had made reservations for one night, but after our 2-hour scouting trip, we decided to stay for two nights so that we would have an entire day to enjoy the forest. Kentucky Warbler. Photo © http://www.BirdPhotos.com. On Saturday, we drove the Panoram Loop which was mostly gravel roads. Wild geraniums and ferns carpeted the edges between the roads and woods. We didn’t see as many birds as we had at Magee, but the ones that we did observe made the day a joy. Cooperative birds that gave us great views included Hooded, Worm-eating, and Kentucky Warblers. We heard Wood Thrushes singing their ethereal songs and Ruffed Grouse drumming. The songs of Red-eyed Vireos and Ovenbirds filled the air. Yellow-breasted Chats gave their raucous calls. We observed several pairs of Scarlet Tanagers at eye-level. We saw only a few cars or bikes on the road and met only one other birding party. Worm-eating Warbler. U.S. Fish and Wildlife Service photo. Even with a map, we had a difficult time finding our way out of the forest. After going the wrong direction twice, Sandy flagged down a truck. The driver was Chris Glassmeyer, who didn’t just give directions, but led us back to the highway. Chris was very familiar with the forest as he had worked there for the Ohio Division of Forestry a couple of years ago. We talked about the management of the forest and learned that there is logging, but that the Ohio Division of Forestry received certification from the Forest Stewardship Council (FSC) and the Sustainable Forestry Initiative (SFI) in December 2010 for all 21 state forests. Still, Chris had tired of seeing trees with dollar signs on them and recently went to work for The Ohio Nature Conservancy, where he is an Area Steward. As supporters of TNC, Sandy and I share Chris’ values and we all seemed energized by the conversation about Shawnee and its birds and other wildlife. We enjoyed meeting Chris as much as seeing Shawnee’s beautiful birds. Blue-winged Warbler. Photo © http://www.BirdPhotos.com. We had planned to leave for home on Sunday morning, but the forest called us back, so we spent another few hours in a different area that was recommended for birding. As soon as we turned onto the forest service road and pulled over beside the little stream, we heard birds. Carolina wrens, Gray Catbirds, and Common Yellowthroats called and then we heard a new song. Yes, a male Cerulean Warbler right over our heads! Thrilled that we had decided to spend more time in the forest, we continued on down the road. We saw the first Blue-winged Warblers of the trip – right at eye level. 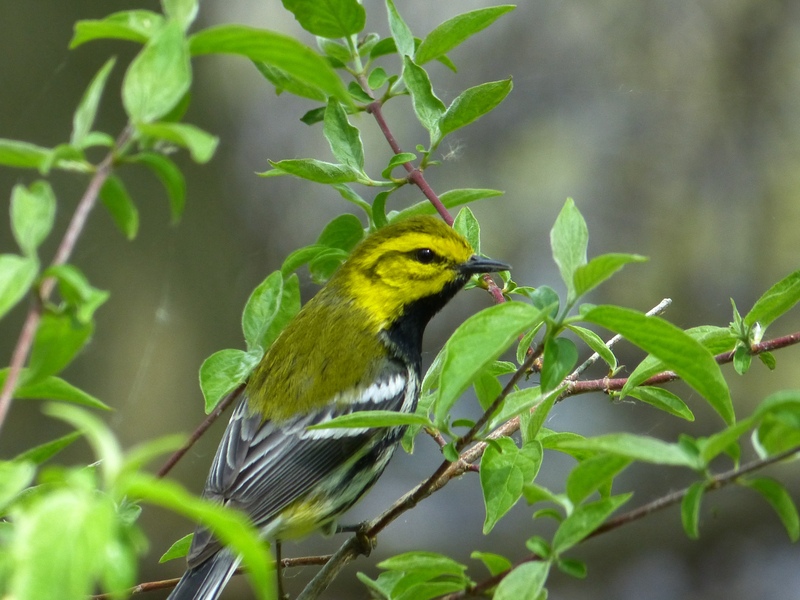 Other highlights included Kentucky and Hooded Warblers. Acadian Flycatchers, Wood Thrushes, and Ovenbirds sang as we slowly drove down the country road. Those last three hours in Shawnee State Forest were an absolutely perfect end to our Ohio birding adventure and the perfect complement to Magee Marsh. We had a total of 116 species of birds for the trip, including 30 species of warblers. Sandy and I look forward to returning to the forest as much as to Magee, but next time we will go earlier in the year when the trees are not fully leafed out. I’ll also work harder to review warbler songs before the next trip. I’ve already written about learning bird songs and I’ll be using Larkwire as I discussed in that post as well as listening to CDs of bird songs. 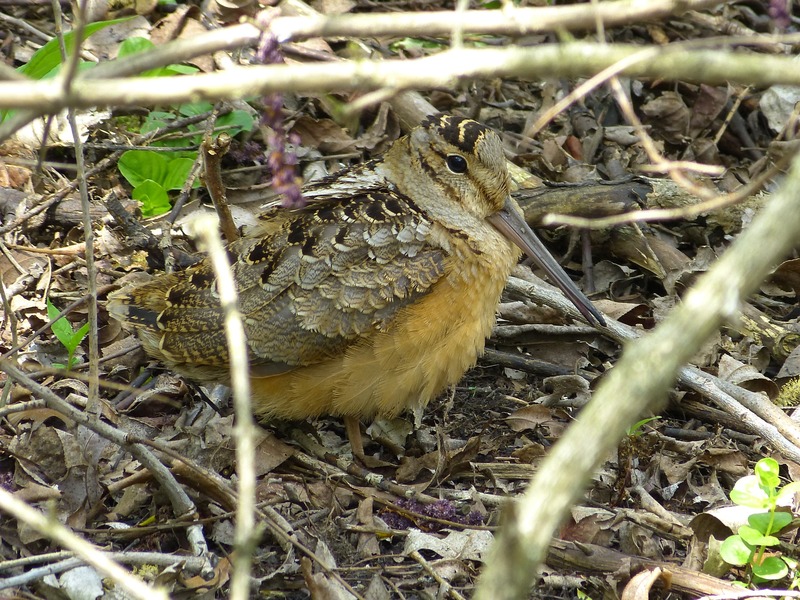 Disneyland for Birders – that is how I heard someone refer to Magee Marsh on the first day. It’s a perfect characterization of this world-famous birding hot spot. It not only provides spectacular eye-level views of birds, but it has that Disney feeling of wholesome, clean, friendly fun. The Great Black Swamp once covered 1,500 square miles of northwestern Ohio extending from Port Clinton to Fort Wayne, Indiana. 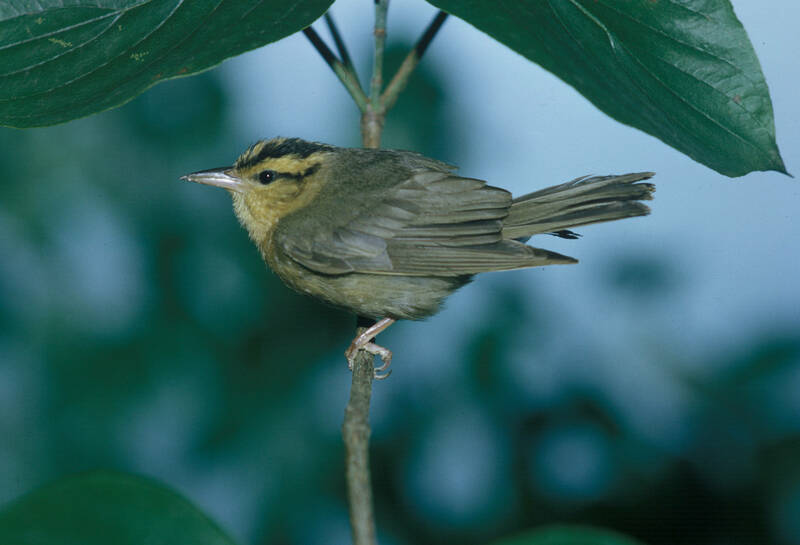 The vast network of forests, wetlands, and grasslands provided vital stopover habitat where tired and hungry neotropical songbirds could rest and refuel before continuing their migration. Today, most of the area has been drained for agriculture; only 10 percent of Ohio’s original wetlands are left. Magee Marsh is one of the few remaining remnants of the Great Black Swamp. Its wooded beach ridges between the marsh and the southern shore of Lake Erie are especially important as the last stop for migrating birds reluctant to cross the lake. Magee Marsh State Wildlife Area, Ottawa National Wildlife Refuge, and other nearby areas protect a few thousand acres of habitat, but the birds are most numerous in the small 7-acre area around the Magee Marsh boardwalk. 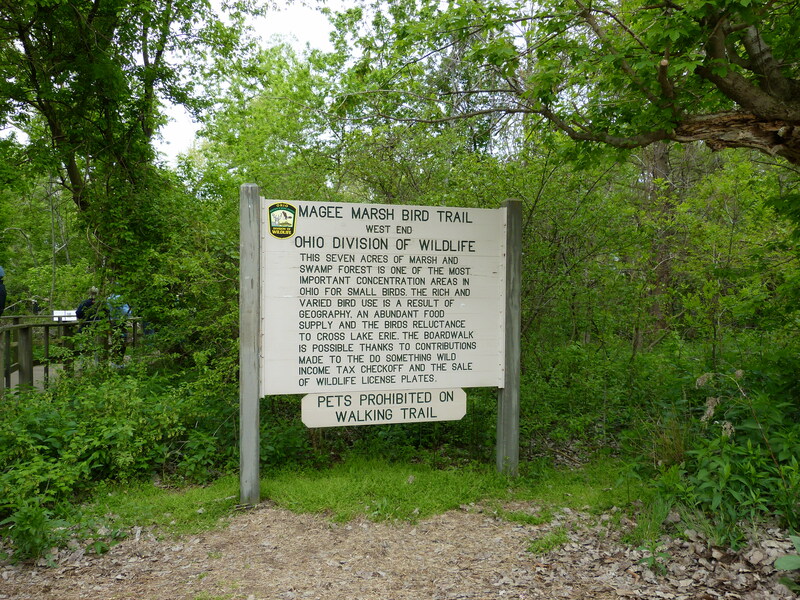 The Ohio Division of Wildlife built the famous mile-long boardwalk in 1989. It is wide, has guiderails, and is wheelchair accessible. It provides birders with a wonderful vantage point for viewing the birds and it protects the habitat from trampling. The birds seem to feel safe and come very close to the boardwalk, even perching on it occasionally. Sandy Beasley, my birding buddy from Georgia, and I arrived on the evening of May 13. I had heard about Magee Marsh for years, but hesitated to visit because of the crowds. Those fears were not justified. The State of Ohio did an outstanding job making the site accessible to visitors. The parking lots are large and well laid-out, there are a sufficient number of porta-potties and they are extremely well maintained. And the wide boardwalk itself comfortably accommodates a large number of people. Most importantly, I was surprised to discover that the other birders actually enhanced my experience. People were friendly and readily shared information. The only “traffic jam” that I encountered was when a Black-billed Cuckoo was sighted. Once I said “life bird”, someone pushed me to the front of the crowd and gave detailed directions for finding the bird. 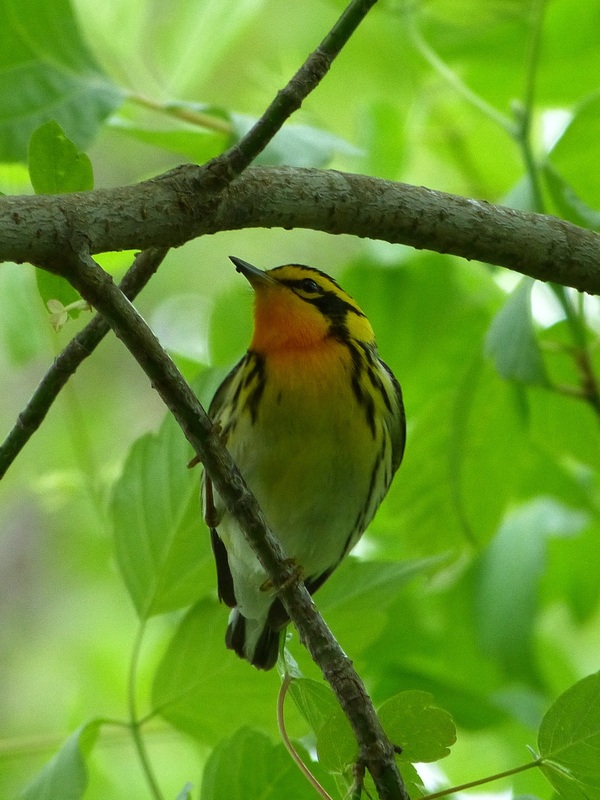 Birders of all levels and from all over the country come to Magee to enjoy the spectacle of spring migration. I frequently encountered groups of people intently looking in a particular direction. When I asked what they were watching, the answers varied from “Mourning Warbler” to “there’s a Robin down there” to “I don’t know what the others see”. As an intermediate level birder, I had the fun of both being helped (such as confirmation of my life Philadelphia Vireo) as well as helping others with finding birds and identification. On our first amazing day at Magee, we enjoyed many close views of warblers. One of my favorites was the Black-throated Green Warbler who flitted around just a few feet from me and even perched on the boardwalk rail for a moment. Another crowd pleaser was this cooperative Blackburnian Warbler who also showed off for everyone close by. The highlight of the day for both Sandy and me was a female Kirtland’s Warbler on the beach. Kirtland’s Warbler is rare at Magee and cannot be expected every year, so we were thrilled to see it, a life bird for both of us. The day ended with an American Woodcock alternately sleeping, preening, and posing for photos right next to the east end of the boardwalk. Our second day was equally wonderful and again we saw many beautiful warblers and other birds. 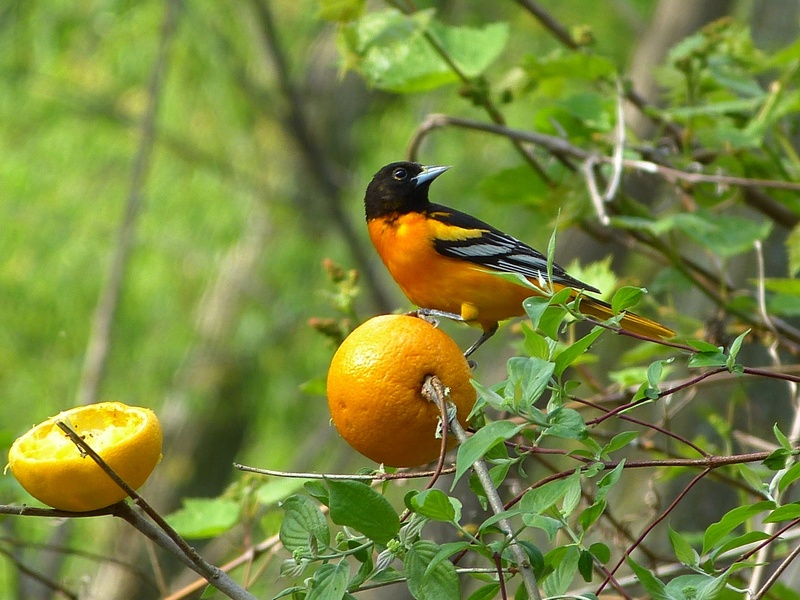 Several Baltimore Orioles brightened the scene and were easy to photograph thanks to the oranges that had been strategically placed for them. We were also treated to another Kirtland’s Warbler, a male this time, identified as a first year bird by experienced birders. Mid-afternoon Sandy went back to the hotel with Barbara, a birder we met who had driven 11 hours from Boston. 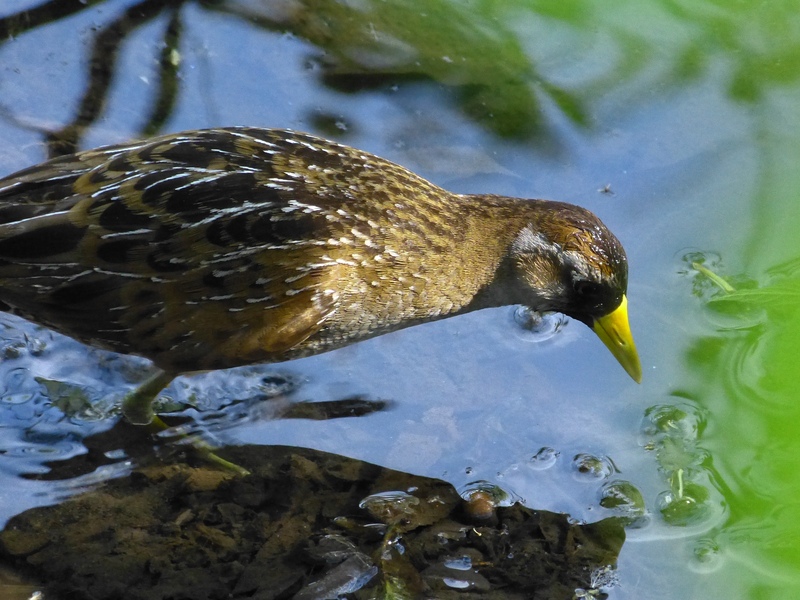 I birded a little longer and saw a Sora near the boardwalk. Then, I, too, returned to the hotel for dinner with Sandy and Barbara to end another perfect day. 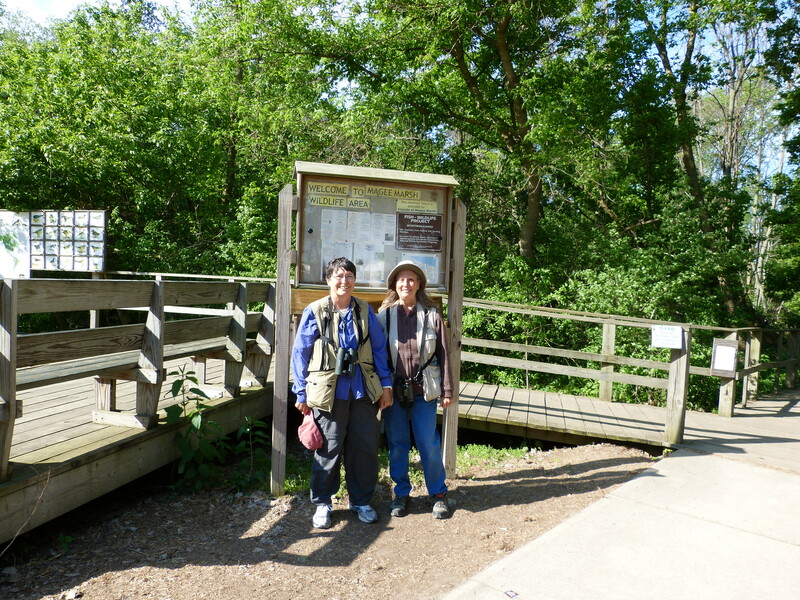 The following morning, Sandy, Barbara, and I decided to bird another area so we headed to Maumee Bay State Park. Maumee Bay has an even longer boardwalk than Magee – 2 miles! It was quieter than Magee had been, but we enjoyed a pleasant day and the simple pleasures of a Blue-gray Gnatcatcher on the nest, a Great Crested Flycatcher calling over the wetlands, Common Yellowthroats everywhere. And we added a few birds to our trip list. 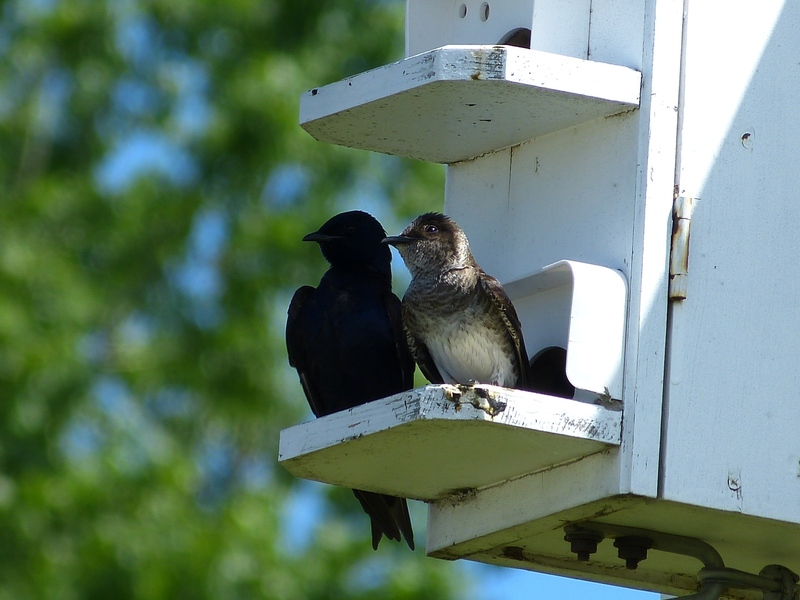 A Purple Martin pair on the “front porch” of their house outside the Nature Center at Maumee Bay State Park. On day four of the trip, we went back to Magee Marsh and saw almost no warblers in an hour’s birding. The weather must have favored their continued journey north and had not brought in replacements. We quickly changed plans and drove south towards Shawnee State Forest. Magee Marsh had exceeded our expectations in every way. Sandy and I both plan to visit “Disneyland for Birders” again. I used the website Birding Magee Marsh for trip planning. I wish that I had seen the info on Tips for reporting bird sightings at Magee Marsh Wildlife Area to eBird before the trip so that I could have kept better lists. There is no general hot spot for “Magee Marsh” because it spans two counties. 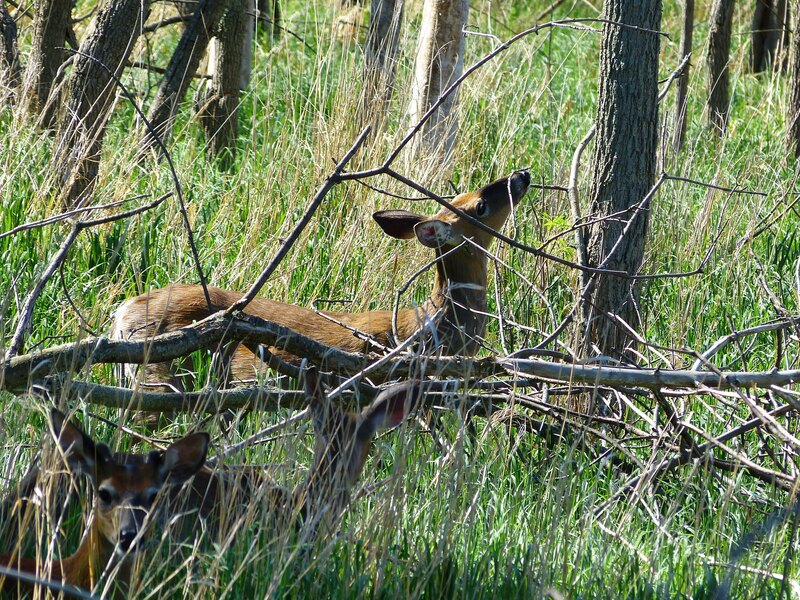 For a detailed and interesting article about Magee Marsh by Kenn Kaufman, see Magee – Anatomy of a Migrant Hotspot.